Whether Holman Plumbing & Water Treatment is installing a submersible pump for you on Vancouver Island, or you're doing it yourself, it's helpful to have pipe that is quick and safe to install. 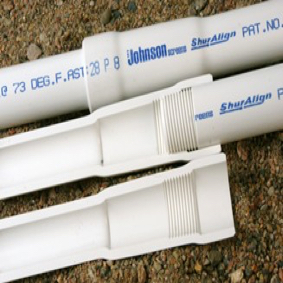 The Shur-Align drop pipe's patented design allows for that when installing any submersible pump. The patented Shur-Align joint is an innovative and simplistic PVC pipe assembly design; it features a simple alignment and engagement, a beveled shoulder, quick makeup, and watertight seal.